National Museum of the Philippines, for the history buffs. National Museum of the Philippines finally found a home. For all the fractious politics and rowdy elections that make the Philippines such a seemingly turbulent outpost of Western-style democracy, there is something ennobling about a nation that styles itself “the land of heroes”. All throughout the Spanish, American and Japanese occupations, many individuals sacrificed their lives in the name of freedom. The country’s history is written in blood. Resentment at injustice and oppression flared up time and again in violent insurrection against great odds. Today, little remains of that legacy beyond pictures of heroes in public schools and in peso bills. Still, there is National Museum of the Philippines, in what used to be the government center in Manila, repository of a brave people’s natural history and ethnographic heritage. Museums are not very big in the country. They are greatly outnumbered by art galleries. In fact too many Filipinos are preoccupied with today’s fads and tomorrow’s emigration to foreign shores. For the culturati, therefore, finding a suitable home for the National Museum of the Philippines has been a bit of a struggle. Always, the Museum was relegated to poor-relation status, taking over a building when a government agency vacated it for better quarters elsewhere. Early in the 20th century, fortunately, the American architect Daniel Burnham (of Washington D.C. Union Station and Chicago city planning fame) was commissioned to lay out a suitable capital city outside the cramped confines of Intramuros. One result of his efforts was a horseshoe of government buildings around the periphery of Luneta Park: the Executive, Legislature, Finance and Agriculture buildings. In the aftermath of destruction caused by the Liberation of Manila and during Martial Law, a great expansion in the numbers of congressional districts engineered by President Marcos, Congress and the Executive departments transferred to the open vistas of a new government center in Quezon City. 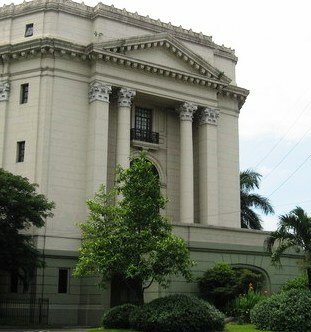 Then the National Museum of the Philippines moved into the old Congress building. Having too many artifacts and archives, however, the Anthropology and Archaeology Division needed a building all to itself. Thus it was that the nearby building vacated by the Department of Finance became the “National Museum of the Filipino People.” The latter is arguably the more frequented since it houses Juan Luna’s “Spoliarum”, the grandest and most famous painting by a Filipino ever. Anything worth seeing inside the National Museum of the Philippines? Inside the National Museum of the Philippines proper is a vast array of historic and cultural artifacts. Among them are pre-Hispanic artifacts, primitive tools that the Malays and the Negroid Aeta aborigine tribes used. The most renowned collection of the National Museum in Manila is that of the “San Diego”, one of the galleons that plied the Manila-Acapulco trade. The galleon had been sunk by a typhoon with all hands and an entire cargo of Chinese porcelain, gold, jewelry and weapons. Found and raised largely intact, the artifacts now make up a whole gallery revealing plenty about 17th century life in the country. To Europeans and Americans, the goods from the “San Diego” are instant lessons about the links that had once prevailed between the Orient, the Old World and the New. The centerpiece of the National Museum collections, hanging as it does in the main ground floor gallery, is Juan Luna’s “Spoliarium”. A very large canvas about 23 feet wide and 13 feet tall, the “Spoliarium” depicts life-size figures in a scene of vanquished Roman gladiators being dragged to a pile of corpses while spectators look on and a woman grieves alone in a corner. As a work of art, “Spoliarium” took the gold medal in Madrid’s Exposicion Nacional de Bellas Artes of 1884. 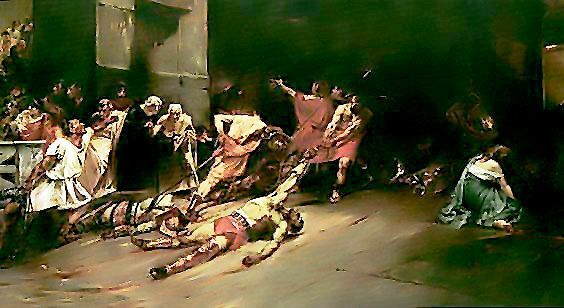 To the Filipino people, still struggling to throw off the yoke of Spain, “Spoliarium” was a heroic representation of their own slavery, sacrifice and tragedy. Amid the glitter and glitz of Japanese cars, designer brands, Finnish mobile phones and MTV pop music that typify Filipino lifestyles today, the National Museum of the Philippines and its properties substantiate the sources of the country’s culture. Owing to its conquerors and its position as entrepôt in Southeast Asia, the Philippines has indeed assimilated many elements of Malay, Indian, Chinese, Hispanic, and American culture. Today, Australians, Koreans, Finns, Thais, Nigerians, Japanese and Arabs add to the mix and the Museum a century hence will undoubtedly reflect that even more heady brew.